We were one week into the semester, and for the whole week, we had been talking about the possibility of buying this goat from the couple who would bring us our re-ration of food and fuel. Our instructor, who knew the couple, said that if we were lucky they might make us cheese, too. When he first mentioned the goat, I thought he meant we were buying a friend to come hiking with us, so I got really excited. 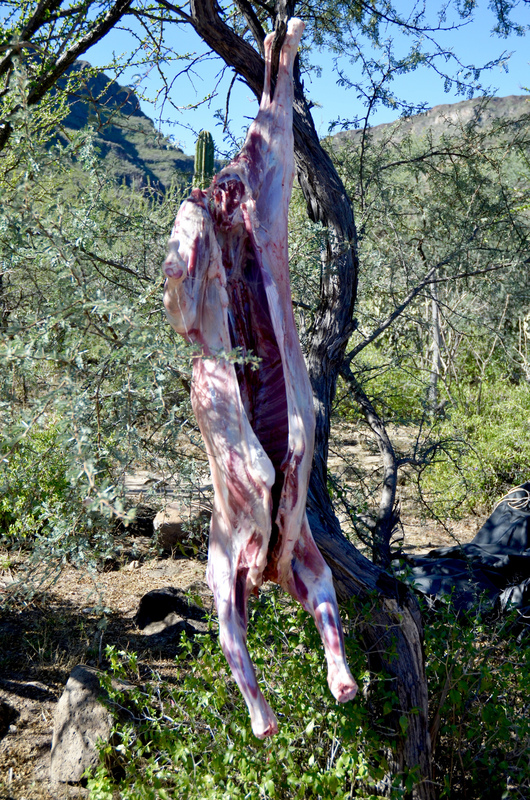 Of course, he actually meant that we were buying the goat to roast and eat. I still liked the idea of it hiking with us. Ration day came, and the couple brought our food, but no goat. As we sorted the food, we quickly realized that fuel was missing from the ration. The couple had to go back to their farm to get it, so indeed we did get lucky: they brought back a goat, limes, and fresh cheese. When I think about the most memorable moments from my backcountry trips, a lot of them surround food. 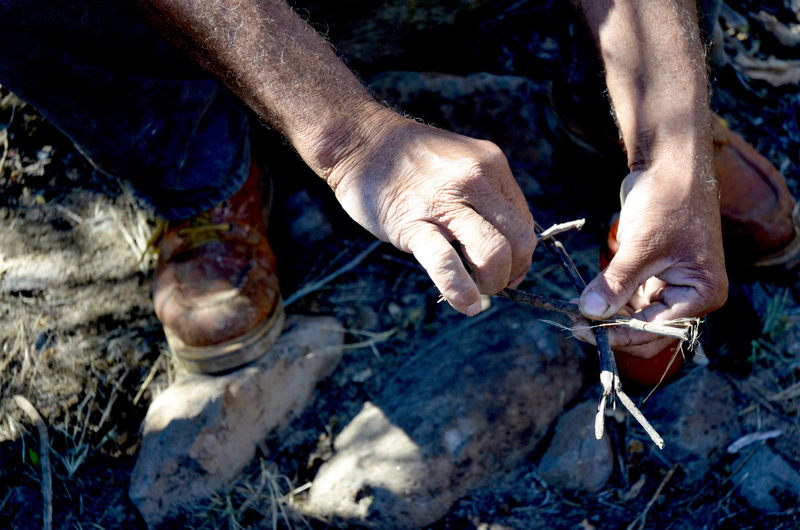 Sustenance in the field is important—the mistakes and victories become stories that can define a trip. 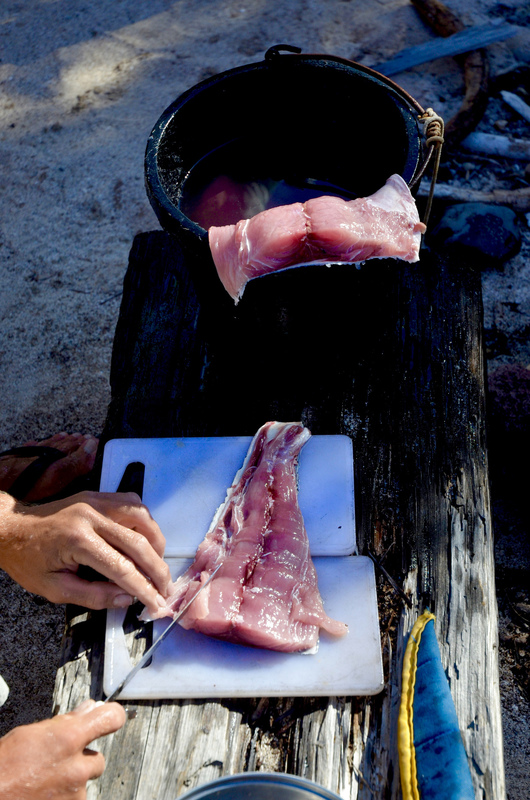 In Baja, we bought fish from locals, were given limes and picked oranges, were treated to a huge meal of beans, rice, fish tacos, salsa, and the works. Sharing meals and conversation with them brought variety to the solitude of our group of 16, and taught us things we couldn’t learn anywhere else. It felt powerful to interact with locals through food and discussion. 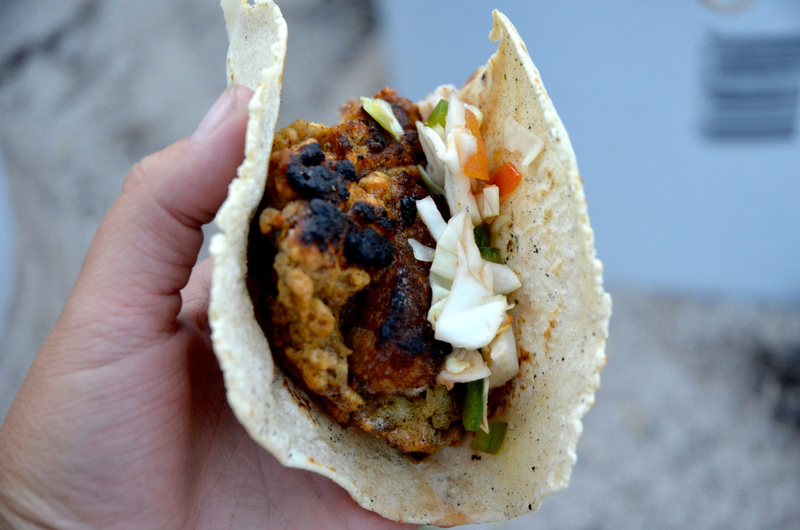 Beyond food, there was so much to my experience in Baja. I was able to take a lot of photos during my semester, so I'll leave the rest of the storytelling to these images. A local rancher describes, and shows us with sticks, how his wife makes goat cheese using cloth and a sieve. 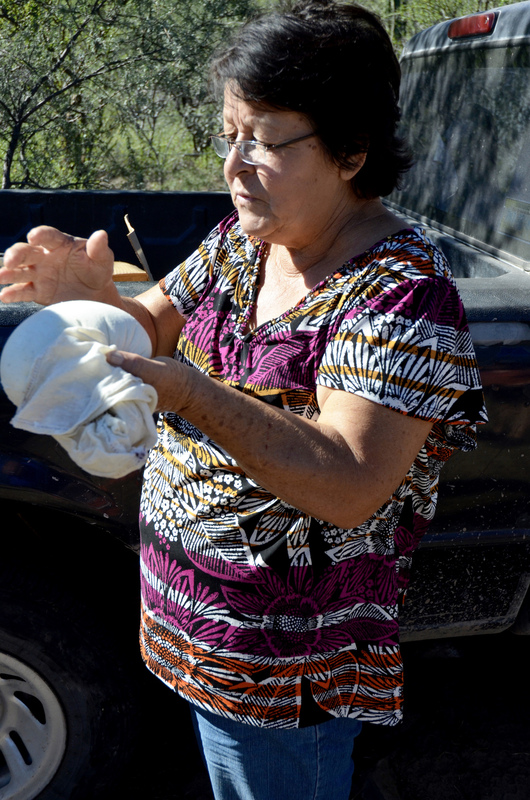 A local rancher gives our group instructions on how to care for the cheese she made that morning from goat’s milk. The temperatures in February in Baja can reach the high 80s, so keeping cheese good can sometimes be a challenge. The goat we bought from a local couple hung on a tree. 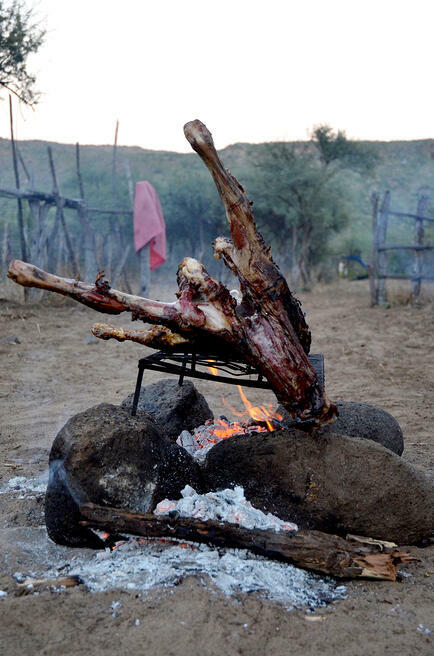 That evening, we stoked a small fire for six hours and slowly turned the goat until it was finely crisped, while the vegetarians in our group made a meal for themselves. Meat felt like a huge luxury, even after just a week of being in the wilderness. The course started with a three-week hiking section. Most of our time was spent off-trail and exploring the different river beds (arroyos, in Spanish). Sometimes we hiked on dirt roads, like this one. This was a rare misty morning in Baja: a welcome sight when it’s generally very hot and sunny. 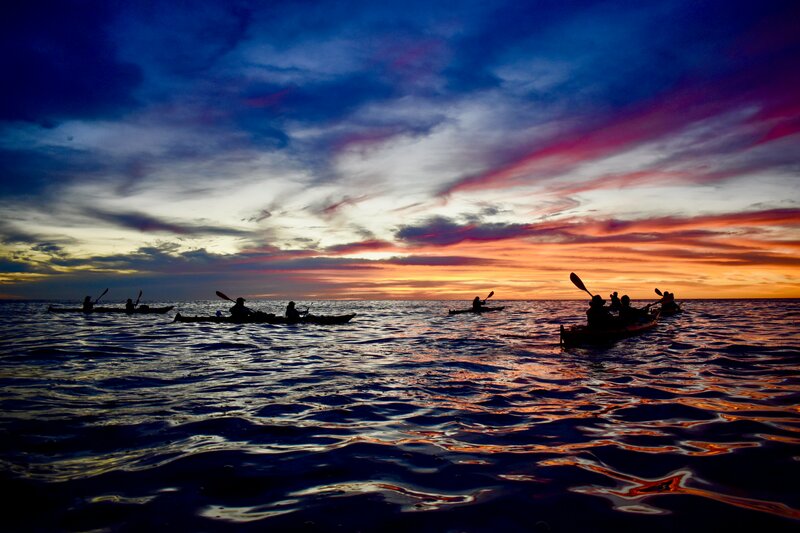 The sunsets in Baja leave nothing to be desired. The colors seem brighter there, somehow. 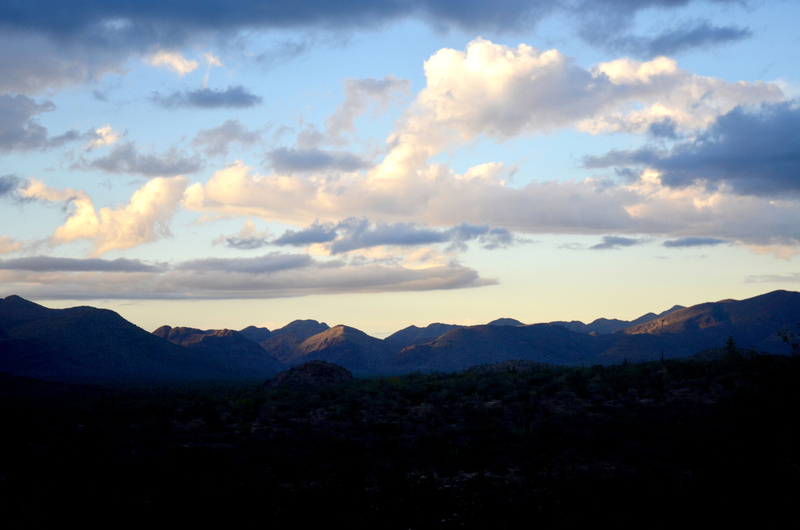 These mountains served as the backdrop for a campsite on one of the last nights of our hiking section. 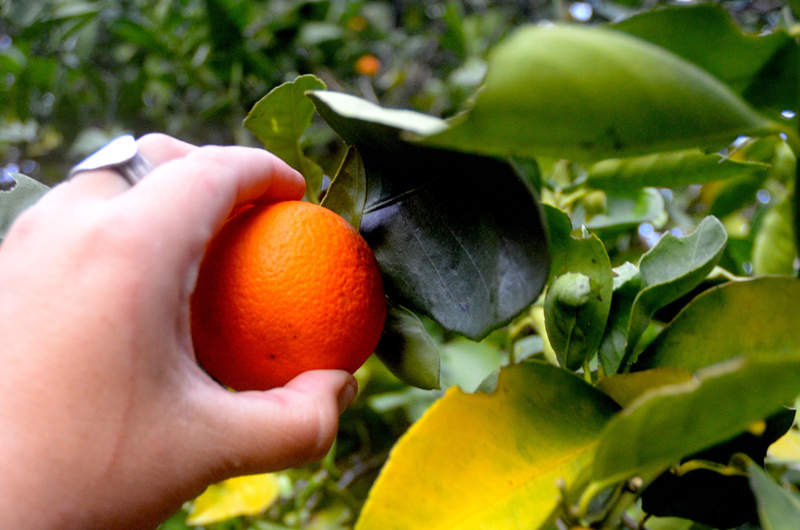 Near the end of the backpacking section, we found an orange grove. We picked as many oranges as we could fit in our backpacks, and bribed those with more room to carry what wouldn’t fit in our own packs. 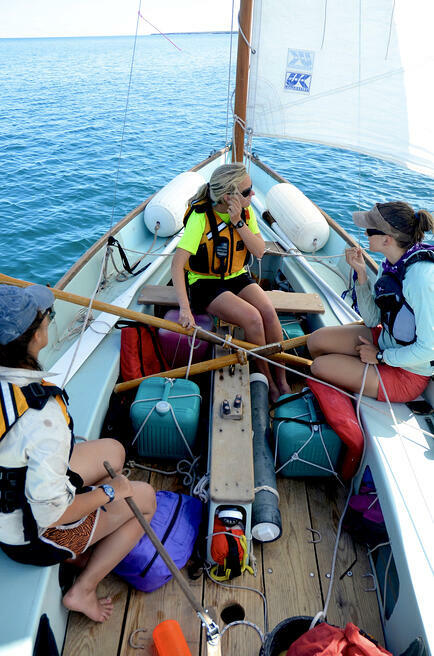 We moved into the month-long sailing section of our course with these four Drascombe Longboats. These kinds of boats are only used by NOLS in Mexico. They’re 22-foot open yawls, so you camp on shore every night. Gear gets packed into the back, or stern, of the boats. 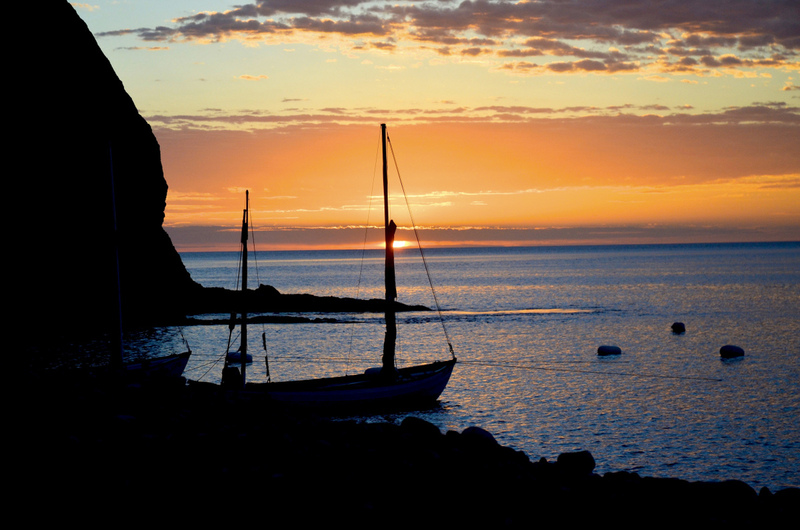 In this photo, we were camping in a protected little cove, and we spent some of our time there when we weren't sailing hiking to the top of the cliffs surrounding our camp. When it was windy, we sailed. When it wasn’t, we rowed the boats with big wooden oars like you can see in this photo. We often anchored our boats close to shore, but deep enough so that if the wind shifted they wouldn’t hit the bottom. 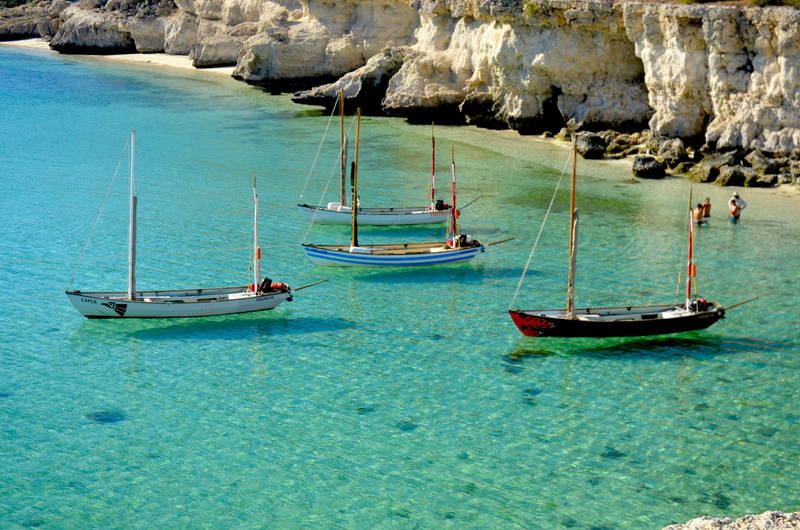 After anchoring the boats, we would swim back to the beach where we were camping. This picture was taken at sunrise from my sleeping bag. Baja has a lot of small fishing villages only accessible by boat, and we got to meet some people in these villages who sold us their catches. Our instructor skins a fish we bought from a local fisherman in this photo. 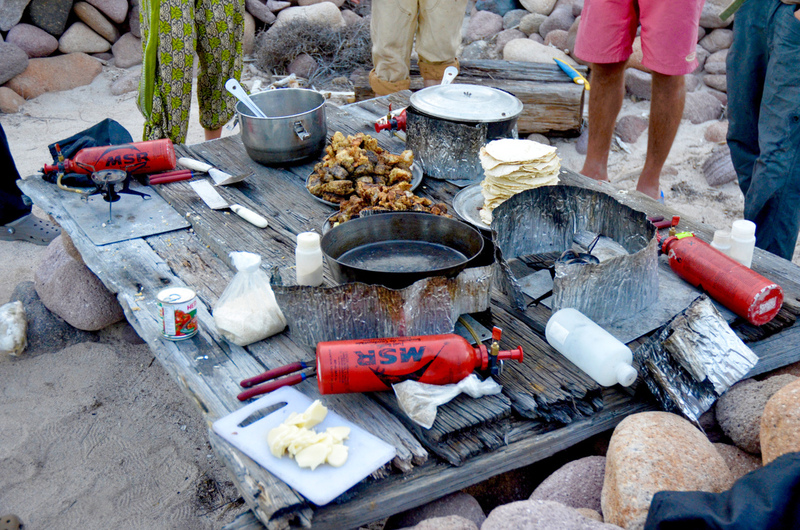 The first night we bought fish, all 16 members of my group came together and spent hours making tortillas, frying fish, and cutting vegetables to make fish tacos. To make the tortillas, we were given tortilla presses that we carried with us the whole time. 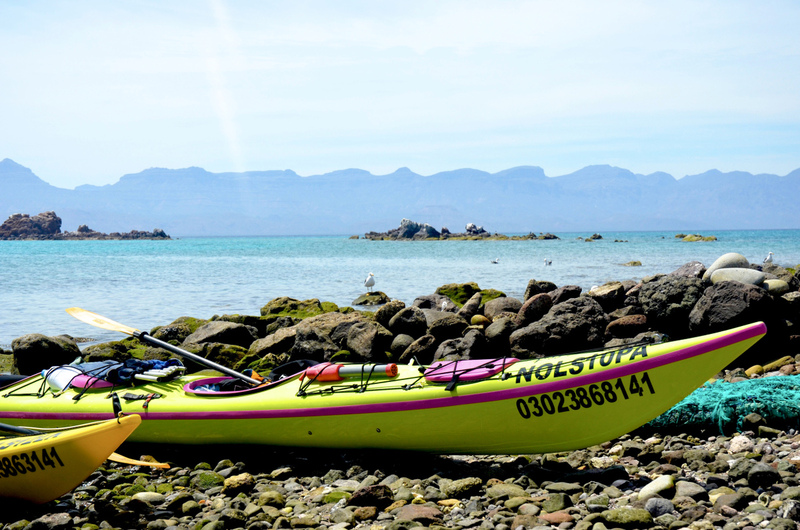 Our course then moved into the month-long sea kayaking section. 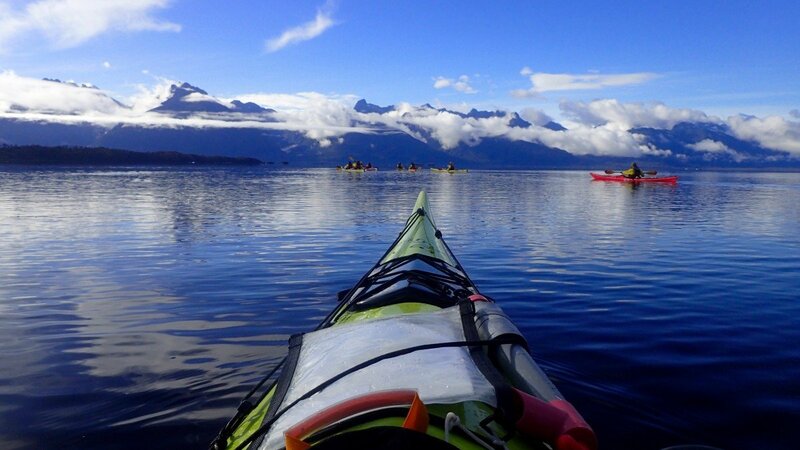 We paddled a combination of single and tandem kayaks, and switched boats every few days to get an idea of which ones we liked the best. 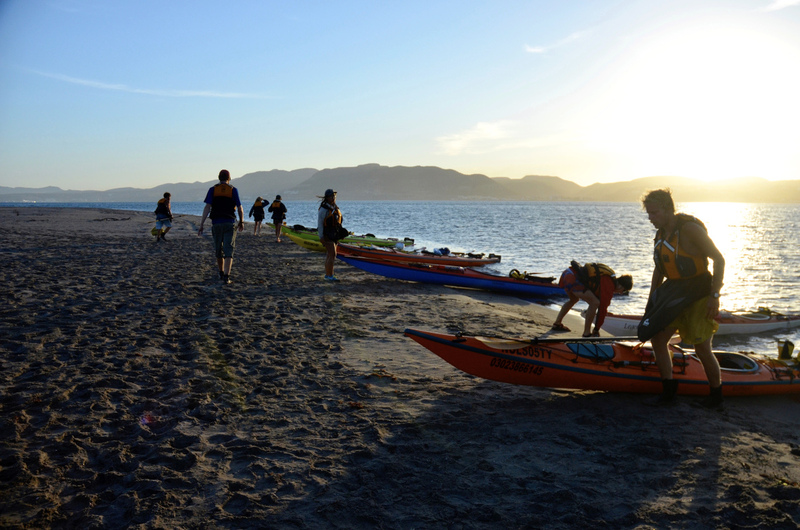 We generally woke up early to start paddling before it got too hot, and did a lot of swimming to stay cool. If there was time after the traveling portion of the day, we’d practice rescue skills and fun kayak tricks. One afternoon, a young manta ray washed up on shore, and our instructor approached and gently handled it to see if it was male or female. Talk about experiential learning! 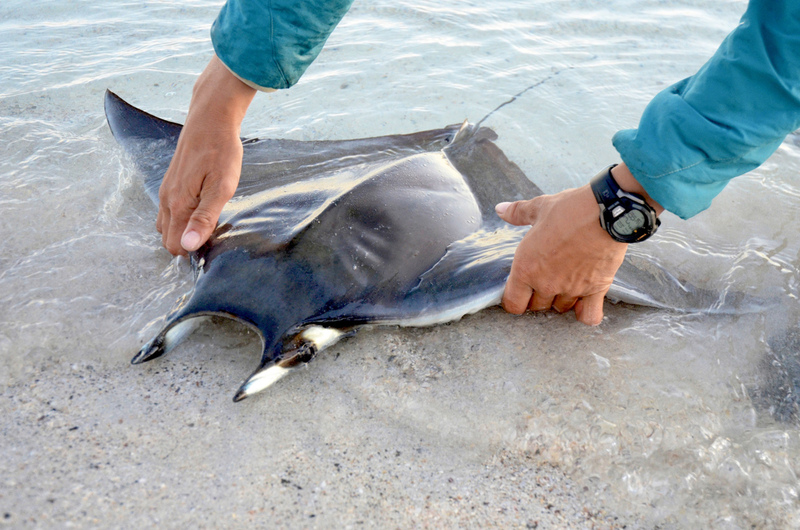 Mantas don’t have stingers like other rays, and we saw them all the time on the water sections of our semester. They love to jump out of the water and slap their stomachs on the surface. The geology changed as we traveled south toward La Paz. 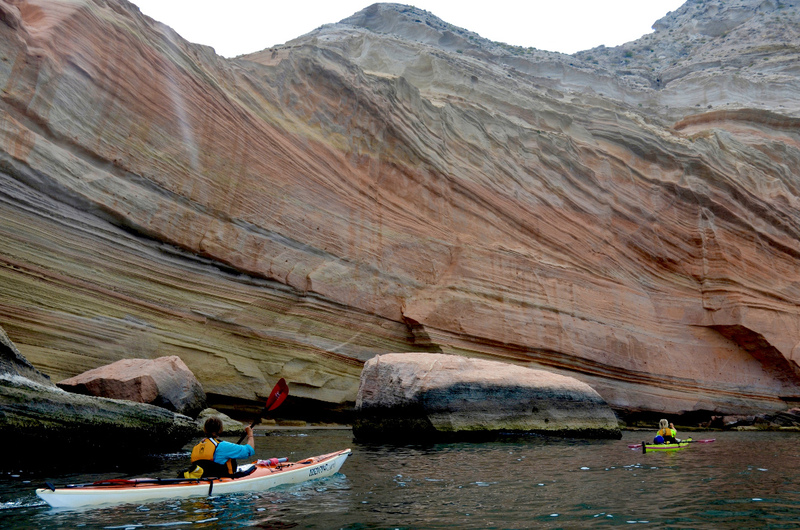 We got to paddle into caves, through arches, and along giant rock walls like this one. Sometimes we got to visit villages on the coast and islands. This photo is from the shore of Isla San Diego, a small village only accessible by boat. The locals told us about life there, and how they preserve fish so they can eat it when the fishing is less successful. 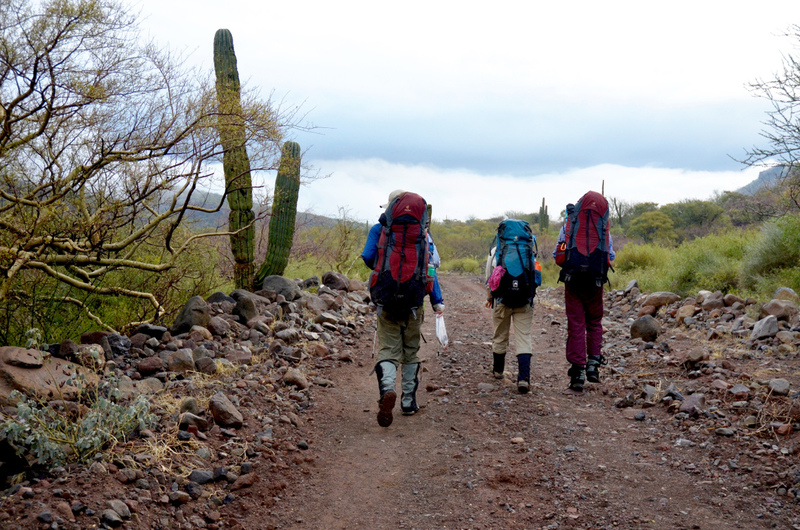 At NOLS Mexico, you learn outdoor skills and then some. You experience things that you couldn’t anywhere else. We connected to people through food, conversation, and shared appreciation for a place. Living and traveling in Mexico gave me an enormous respect for the people and the adversity they face every day. Living in an extremely remote and unforgiving desert is no small feat! Nothing is taken for granted: clean drinking water, food, fuel for cars or boats, to name a few. It was incredible to see how people live in wildly different ways than I do at home in the U.S. While we weren’t interacting with locals every day, it was an enlightening part of our course. The Mexican backcountry is beautiful, but is also rich with a culture and history that I'm grateful I had the privilege to learn about. 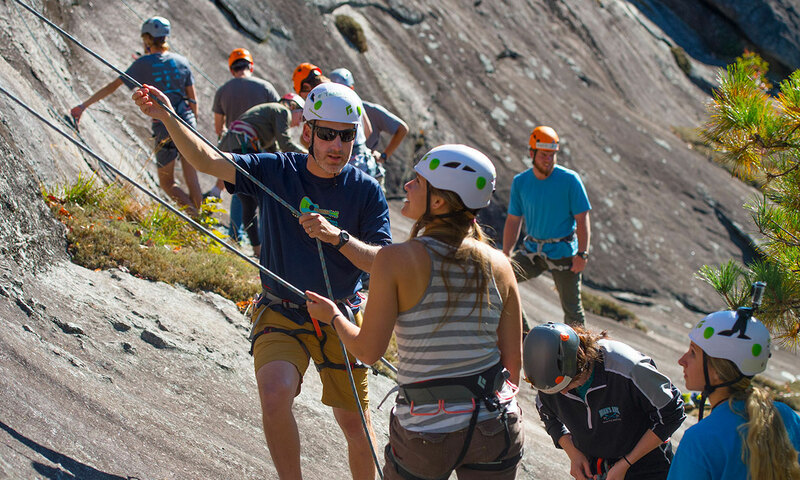 Learn more about studying abroad with NOLS. 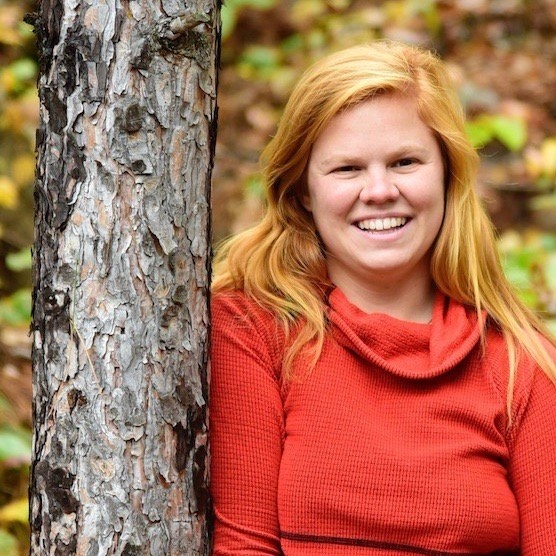 Claire is the PR and marketing intern at NOLS. She enjoys moonshadows and playing in/on/around water.